A British actress with Down syndrome who appears on a popular BBC show is attracting acclaim from viewers around the world. Sarah Gordy, 30, plays Lady Pamela Holland on the drama “Upstairs Downstairs.” The 1930s-era show focuses on a wealthy London family and their servants. Gordy’s character is positioned as the sister of one of the show’s leading men who spent years in a mental institution because of the stigma associated with Down syndrome at that time. The actress says she appreciates the platform the role has given her to show the public what those with Down syndrome are capable of. Her character’s reunion with her beloved brother, Sir Hallam, formed the heart-rending finale to the first series of Upstairs Downstairs and provided a stark reminder of the way things were done ‘back then’. Hidden away in a mental asylum because her Down’s syndrome would bring shame on the family, Lady Pamela Holland lived a solitary half-life with only her cherished photographs for company. Tonight, viewers will see her returned to her rightful home, 165 Eaton Place, as the revival of the BBC drama returns to our screens for a second series. Much is riding on the show – there have been inevitable comparisons with Downton Abbey – and it’s hoped that Upstairs Downstairs, like its ITV counterpart, will be commissioned for a third series. And no one is hoping that happens more than Sarah Gordy, who plays Lady Pamela. As any actress would be, she is delighted to have a major role on prime-time television, but it also means so much more. 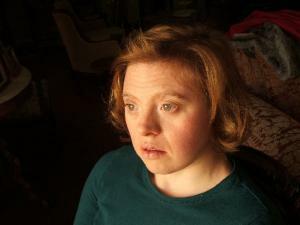 For Sarah, who, like her character, has Down’s syndrome, this marks a milestone in an already extraordinary career. More delicate than she looks on screen, Sarah is 5ft with pale, twinkly blue eyes, fresh skin and a smile that enchants everyone she meets. Now in her early 30s and utterly guileless, she does not hide her delight at her newfound stardom. ‘It’s great,’ she giggles, sipping on a glass of champagne – her favourite tipple. When she is working away, her mother always keeps an emergency bottle in her suitcase. There's a great article in Entertainment Weekly this week about actors with Down Syndrome! Even made it as the first headline on the cover!